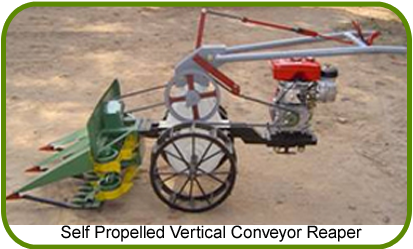 The unit consists of a seed drum, main shaft, ground wheel, floats, furrow openers and handle. The seed drum is hyperboloid shape (truncated cone) with 200 mm diameter having 12 mm flat spikes of 25 mm length kept parallel to the axis of rotation. The slopes of the cone facilitate the free flow of seeds towards the metering holes. Nine numbers of seed metering hole of 10 mm diameter were provided along the circumference of the drum at both the ends at a row-to-row spacing of 200 mm. Two floats were provided on either side to restrict the sinkage and to facilitate easy pulling of the unit. Uniformity in seed sowing and plant population. Reduction in seed rate and the cost of thinning is reduced. Hill dropping of seeds is achieved and continuous drilling is eliminated. 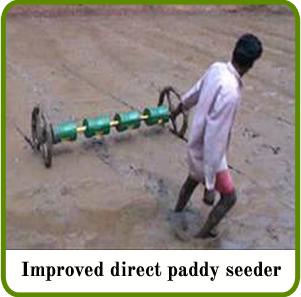 Function : It sows paddy in 3 rows and green manure in 3 rows simultaneously. The seeder has two drum hoppers , two skids, a ground wheel and a handle. Paddy seed rate can be adjusted from 72 – 75 kg per ha. The seeder simultaneously sows pre germinated paddy seeds and daincha seeds in alternate rows and puddled soil. The advantage of this seeder is avoidance of separate cultivation of green manure crop. Growth of competitive weeds is checked due to green manure crop. 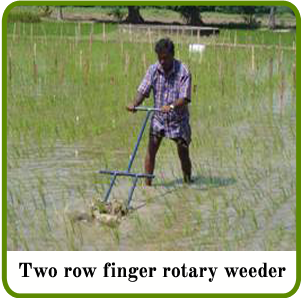 Function : For transplanting mat type paddy seedlings. Suitable for all transplanted type paddy varieties. The machine consists of a seedling tray, forks, handle and skids. By pressing the handle, the forks pick-up the seedlings and plant them in 6 rows. For every stroke of the handle the seedling tray moves side wards for uniform picking of seedlings by the forks. The operator has to pull the machine while punching the handle at the desired spacing. The Row to row spacing is 200 mm. Planting can be done in 6 rows at a time. 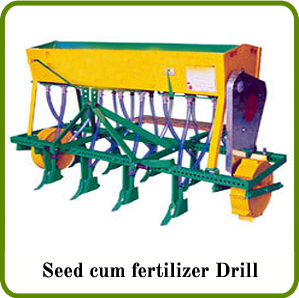 By applying the required quantity of fertilizer at root zone, better crop growth and more yields is obtained. The cono weeder has two conical rotors mounted in tandem with opposite orientation. Smooth and serrated blades mounted alternately on the rotor uproot and burry weeds because the rotors create a back and forth movement in the top 3 cm of soil, the cono weeder can satisfactorily weed in a single forward pass without a push pull movement. By push pull action the weeds are buried and soil aerated. Vertical conveyor reaper (0.75 m) of TNAU is light in weight and hence shifting the reaper from one field to another is easy. Operating the reaper is fatigue free. The total cost of the machine is well within the purchasing power of the small farmers. It is highly cost economical when compared to other paddy harvesters and combine and manual harvesting. 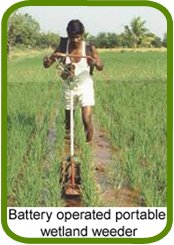 Function : For harvesting and windrowing non-lodging paddy varieties. It is a self propelled unit and width of coverage is 0.75 m.
The machine consists of gear box, ground wheels, handle, cutter bar assembly, star wheels and gathering header assembly. The crop should be manually harvested along the four sides of the field for a width of 0.5m and cleared from the field for providing space to the machine. At one corner an area of 2 x 1.5m should be manually harvested to place the machine initially in the field. Since the harvested crop is discharged at the right side of the reaper the harvested should be turned always to the left side. 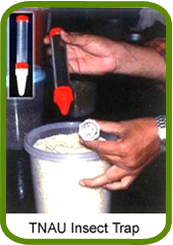 Function : For broadcasting granular fertilizers like urea, DAP etc in the field uniformly. It consists of a hopper with tapered bottom, with a side slope of about 46 degrees. A circular disc having X sections is fitted on a vertical shaft below the fertilizer hopper and is rotated by a handle through gear arrangement. The gear ratio between the handle and the spreading disc is 1:8.4. A metered quantity of the fertilizer through adjustable opening falls on the disc, which spreads uniformly due to centrifugal force. Machine is mounted on the shoulders and is operated at a forward speed of about 2.0 km/h. 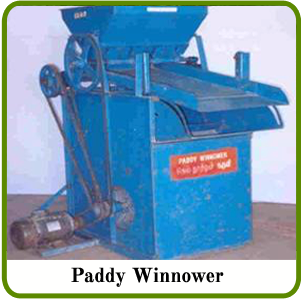 The machine winnows paddy already threshed by the paddy thresher or by other means. It has a feeding hopper at the top to receive the threshed paddy, chaff and straw bits. A blower provided at the bottom sends a stream of air which separates the straw, chaff and other impurities. The dust, chaff and straw come out through an opening and cleaned paddy is taken out through another spout. 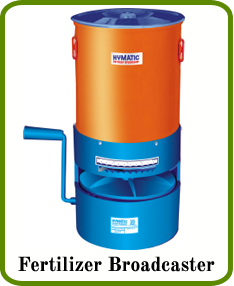 The parboiling drum is made of galvanized iron sheet of 20 gauge thickness with a lid. The drum is divided into three equal portions. The top two-third portion retains paddy for parboiling and bottom one-third portion holds water to produce steam for parboiling. A perforated slanting sheet with perforated pipes separates the steam chamber from parboiling chamber. The lateral perforated pipes attached to the main steam pipe divides the entire parboiling chamber into a number of small compartments and helps for uniform and simultaneous parboiling of paddy. Perforated sloping floor helps for natural unloading of parboiled paddy. 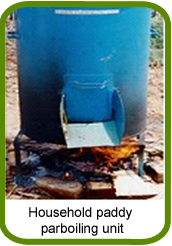 The water in the drum can be heated by burning firewood or any agricultural waste. After the completion of parboiling, the remaining hot water can be used for next batch. Uniform parboiling and increased head rice recovery is possible. Times 45 minutes for parboiling the first batch of soaked paddy and 25 minutes for the subsequent batches. It can also be used as a storage bin, when not used for parboiling. The basic characteristics of the stored product insects, viz., affinity towards air, tendency to move towards aerated region, wander in the grain and active during dusk and dawn have been exploited in the development of the trap. The stored grain insects, like red flour beetle, saw toothed beetle, rice weevil, paddy moth, turmeric beetle, drug beetle, pulse beetle, groundnut bruchid, dermestid beetles, flat grain beetles, etc with the behaviour of wandering in the bulk grain, reach the insect trap. These insects will enter the trap through the perforations and reach the stem of the trap. In the stem, as the insects cannot move upward and escape, they move towards the bottom and reach the pit fall placed at the bottom. Suited only for bin storage. 2 or 3 traps can be placed at 15 to 20 cm depth in a bin of 30 to 45 cm diameter and 25 kg capacity for maximum benefit. No insecticide is used in this trapping technique. Easy to handle and maintenance free.